Choose Your Pup breed Purebred Kelpie and Heeler pups for use as working dogs, agility and obedience competitions, security purposes and for companionship. 25/09/09 - Choose your pup specialise in the breeding of purebred Kelpie & Heeler pups. 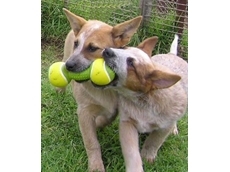 They produce intelligent dogs which can be raised to work a range of livestock under a range of Australian conditions.